Beautifully engraved certificate from the Mattel. Inc. Toy Company issued in 1971. 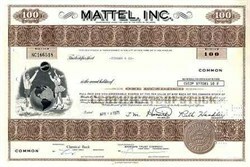 This historic document was printed by the American Banknote Company and has an ornate border around it with a vignette of two kids playing on clouds on both sides of the old Mattel Logo and a globe of the world. This item has the printed signatures of the Company�s President, Ruth Handler and Secretary, T. M. Horwith and is over 34 years old. Mattel Inc., the world's largest toy company (2004 revenues), produces products including Barbie dolls, board games, and, in the early 1980s, video game consoles. It was started in 1945 by founders Elliot Handler and Harold "Matt" Matson (hence the name 'matt-el'). Elliott Handler's wife Ruth Handler would later become president, and is credited with establishing the Barbie product line for the company in 1959. The company originally produced picture frames and dollhouse accessories from picture frame scraps. With the success of their dollhouse accessories, the company turned its attention to toys. The company became publicly owned in 1960. In 1993, Mattel merged with the Fisher-Price toy company. In 1996, Mattel purchased Tyco Toys which was the third largest toy manufacturer at the time. 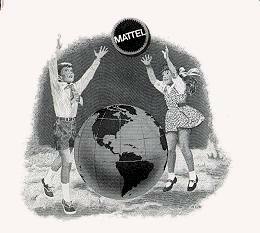 Mattel serves as the parent company for American Girl (formerly Pleasant Company) and Fisher-Price. Currently, it is headquartered in El Segundo, California.